Come with G-Line to experience the very best of Middle England. Based in a four star hotel, our journey takes us to some wonderful Stately homes, offers a true taste of the area and an adventure through a safari park! Our four star hotel boasts a restaurant, bar and leisure facilities including an indoor swimming pool, jacuzzi and gym. 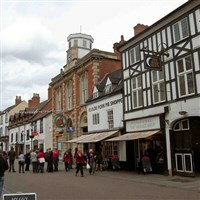 Your holiday includes two excursions plus visits to Melton Mowbray on day one and the Belvoir Brewery on day four. Our excursion today is to the magnificent Burghley House. Mostly designed by William Cecil between 1555 and 1587, Burghley offers 35 major rooms and numerous halls, corridors, bathrooms and service areas. Outside you can enjoy beautiful walks in the historic parkland laid out by Capability Brown. Woburn Abbey & Safari - This wonderful house is set in a 3000 acre deer park and is home to The Duke of Bedford, whose family have lived here for almost 450 years. After your visit to the house we take a tour by coach around the award winning Safari Park, showcasing some of the world's most exciting animals, including lions, tigers, wolves, rhinoceros, elephants, giraffe and many others! - Our journey home calls at the Belvoir Brewery for a 'taste' of Middle England. Enjoy a guided tour and a sampling session before continuing our journey home.